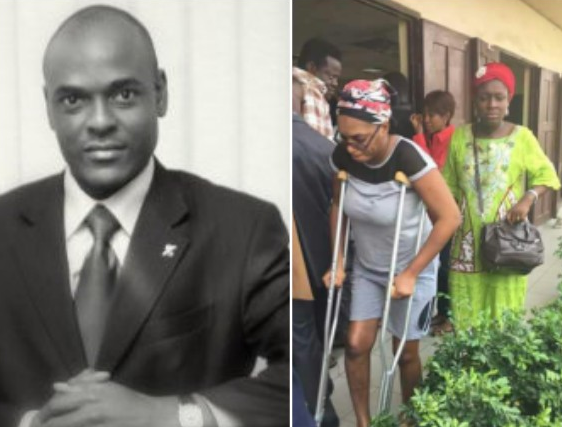 You will recall that September last year, a mother of three, Ivie Edobor, took to Facebook to accuse her estranged husband, John Edobor, a Zenith bank worker of physically attacking her after their marriage crashed. She also accused him of organizing a group of area boys to join him in brutally assaulting her and breaking her legs in the process. Edobor was later dragged to court in a domestic abuse lawsuit for permanently breaking his wife’s leg. Edobor, who for a long time failed to admit his actions, was sacked from his place of work and fled to the US where he said he is currently living as a fugitive. Well he’s now begging for forgiveness after his wife reportedly wrote the U.S embassy to revoke his Visa, which they did, Laila exclusively reports. Recall that his wife who marked one year anniversary of the incident recently, revealed that John ran to United States with his mistress. Edobor who has been stripped of everything, and his mistress eventually leaving him has sent out a public apology to his wife. This may come as a surprise but I’m writing this because I need help. My name is John Okeikhan Edobor former husband to Ivie Edobor. I have offended my wife and children dearly. The repercussion of my actions is catching up with me thus my being in hiding since March in the United States. Please tell her I’m sorry and I am ready to make amends to right all my wrongs. In my defence, I had said a lot of things but that was to take the attention off what I did. I’m now living as a fugitive. I don’t know what pushed me this far. Ivie gave me all the time in the world to make amends but my pride wouldn’t let me. I was so blinded by my relationship with my then mistress, I lost sight of the diamond I had. Yes we had our differences but no woman would have taken all the pain Ivie went through because of me. She has raised my 3 daughters single-handedly. I know my first daughter should be graduating from primary school now and I cannot be there to share in the joy. I have lost my job, my wife and my children because of my act of violence. Ivie supported my family and I for a long time hence my wanting her back. When she wouldn’t come back to me and insisted on a divorce my anger led me to lay ambush and attack her that night but truly I didn’t expect the injury to be so bad I only wanted to scare her. I was so infuriated I got angry and struck her repeatedly on the leg. Please help me plead with her. I was so afraid of going to jail and my mistress assisted me to relocate to the United States. I thought I was home free but Ivie wrote to the embassy telling them about the case on ground and how I jumped bail and my visa has been revoked. My life is hell now as I am now a fugitive living in hiding with no job or source of income. Please plead with Ivie for me to drop the charges in criminal court and allow our families settle us amicably. I am unable to come out in public. Who knows if she won’t involve Interpol at this rate. Ivie please forgive me, I will pay for all the damages to her leg, I will take up responsibility for the children if given the chance. However, John denied begging for forgiveness, saying his email was hacked. Laila reached John via his verified/authentic Whatsapp phone number and during the interview, John said he was beyond shocked when he read online that he wrote an apology letter to Ivie from his hacked email account. Laila also received John’s response to lawyers where he stated that his email account was hacked back in April 2017 allegedly by his estranged wife, so he hasn’t been in-charge of the account since April 2017.